We chat to Mo Rahma, the surfer from UAE who took one of the heaviest Mully wipeouts ever earlier this week. Intrigued, we did a bit of background research on the man featured, and it turns out his story is even more interesting than we’d expected. His name is Mo Rahma, and he hails from Dubai in The United Arab Emirates, where he works for an airline. He’s only been surfing for six years, after learning in the country’s famous Wadi wave pool, and previously held down a career as a professional footballer and then rugby player. However a serious injury put him out of the game and left him forced into water based physio, which is where he first discovered surfing. We decided to hit him up to ask about his journey into surfing and ask how on earth he ended up towing in to a 15 foot bomb, at one of the heaviest waves in the world. WL: So first up, when did you first surf in the ocean, and what was it like? MR: I started surfing at the wave pool, because we don’t have consistent waves in the UAE, we would get 2-3 ft swell here and there in winter, and we would get [surfable] waves about 10 times a year. After I started in the wave pool, I went to Sri Lanka for six months, which was completely different. I struggled reading the waves and getting waves from the crowd. The ocean has that amazing feeling that no pool can bring. 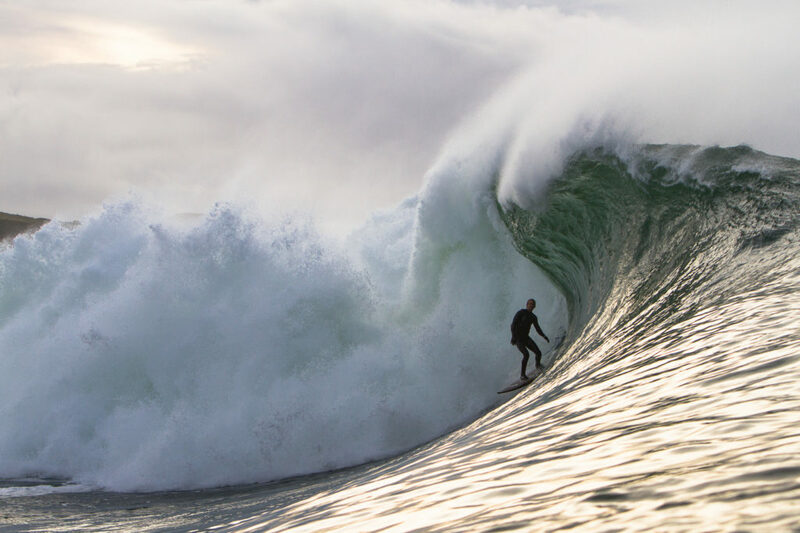 WL: And how on earth did you get from there to surfing on one of the heaviest days of the year so far in Ireland? MR: I met one of the boys that charges Mullaghmore through one of my friends in Dubai and we started talking. I was very scared, I got here three weeks ago hoping to tow. But when I got here the first swell changed from tow in to paddle, so I sat in the channel and watched and didn’t go. But on this swell I just built the courage and went for it. I wiped out on my first wave but then got up and straight back to the lineup and caught two waves after, that I rode all the way out. I’m already looking forward to the next swell. WL: Can you tell me more about that wipeout and what it felt like? MR: As soon I let go of the rope go, I started going faster and I didn’t feel anything until I fell off the board. Then I could feel myself sliding all I did was try and cross my arms to protect my chest and head from impact… well that’s what I thought I was doing, but when I saw the video I wasn’t. While I was sliding I was just hoping that I would slow down and get under before the lip landed on me. It all happened so fast and my adrenaline was super high. All I was telling myself was ‘don’t panic, don’t panic, don’t panic’. When I got hit by the lip it knocked the wind out of me and buried me under. Then I was just holding my breather till I popped up and. Then I took the 2nd wave on my head and then a 3rd and then back out to the lineup. WL: How did you prepare for that session? MR: A lot of praying, like a lot! The Irish Tow Surf Rescue Club played a massive role, they are absolute legends, and the boys Peter Conroy, Barry Mottershead and Connor Maguire. WL: And I guess after playing rugby professionally you’re used to getting pretty smashed. Which is worse, getting stuck at the bottom of a ruck, or getting pounded at Mully? MR: It’s different smash. Getting pounded at Mully was worse for sure though. In rugby when you get hit, it only hurts in the place where the impact was and you have time to recover and breath and let it out. On those big waves when you get smashed you feel sore all over your body. It doesn’t hit you in one spot only, and if it knocks the wind out of you, you don’t have time to breath properly or recover when you come up, and there’s more waves about to land on your head. WL: I saw you competed in the ISA’s, do you have any hopes of competing internationally more? MR: I just competed to put UAE on the surfing map. Surfing in the UAE is not a big sport, in fact it barely exists there at all. So by competing I thought I would be able to bring the sport back to the locals. So yes I might compete more just for the awareness. I’m not a really good surfer, I just enjoy surfing and I would love to see local kids pick up the sport and then hopefully in the future there will someone that will be able to compete and raise the UAE flag high. WL: And so what are your aspirations for the future? more big crazy waves? MR: Yea I’m super pumped to get out again on the next swell, that day was absolutely the best day of my life, two days later and I’m still smiling. WL: Thanks for chatting to us.